Can anyone please identify the manufacturer and/or pattern on this china plate? My grandmother had this plate from at least the 1950s. The glazing is scratched in many places. The floral design seems to be a shiny copper over light lavender blue. I find no identifying marks on the back; but there are 3 marks, at about 2:00, 6:00 and 10:00, which look like places where a mold was attached(??). They are basically circular, raised a bit in the middle -- something like looking down on a volcano. They are not regularly spaced or positioned -- they are various diameters (roughly about 0.5 cm); and at 2:00 and 10:00, they are about 1 cm in from the outer edge of the plate, but at 6:00 it is right on the outer edge. Hi, I'm afraid I can't help you much with this. 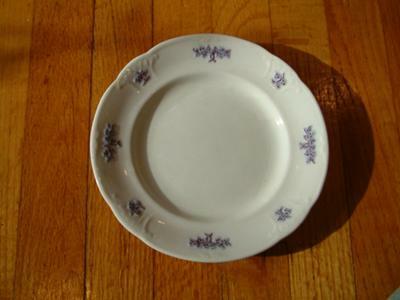 From this small picture it looks as if this were a western style plate, probably factory made. That is quite different from handmade Chinese antiques.